The year 2014 was the warmest year across global land and ocean surfaces since records began in 1880. The annually-averaged temperature was 0.69°C (1.24°F) above the 20th century average of 13.9°C (57.0°F), easily breaking the previous records of 2005 and 2010 by 0.04°C (0.07°F). This also marks the 38th consecutive year (since 1977) that the yearly global temperature was above average. 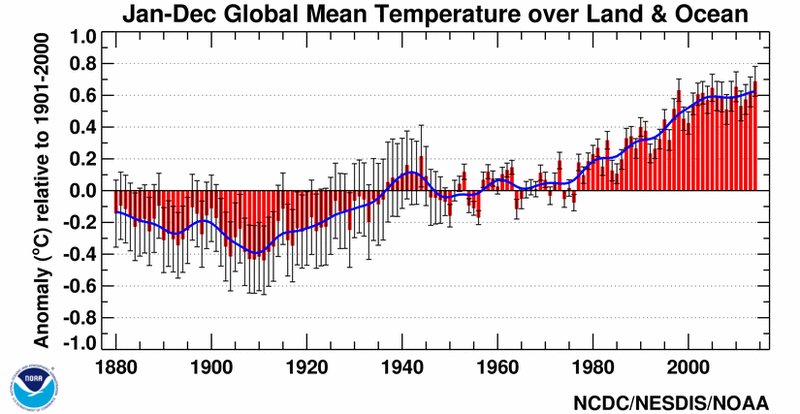 Including 2014, 9 of the 10 warmest years in the 135-year period of record have occurred in the 21st century. 1998 currently ranks as the fourth warmest year on record. The 2014 global average ocean temperature was also record high, at 0.57°C (1.03°F) above the 20th century average of 16.1°C (60.9°F), breaking the previous records of 1998 and 2003 by 0.05°C (0.09°F). Notably, ENSO-neutral conditions were present during all of 2014. The 2014 global average land surface temperature was 1.00°C (1.80°F) above the 20th century average of 8.5°C (47.3°F), the fourth highest annual value on record. Precipitation measured at land-based stations around the globe was near average on balance for 2014, at 0.52 mm below the long-term average. However, as is typical, precipitation varied greatly from region to region. This is the third consecutive year with near-average global precipitation at land-based stations. 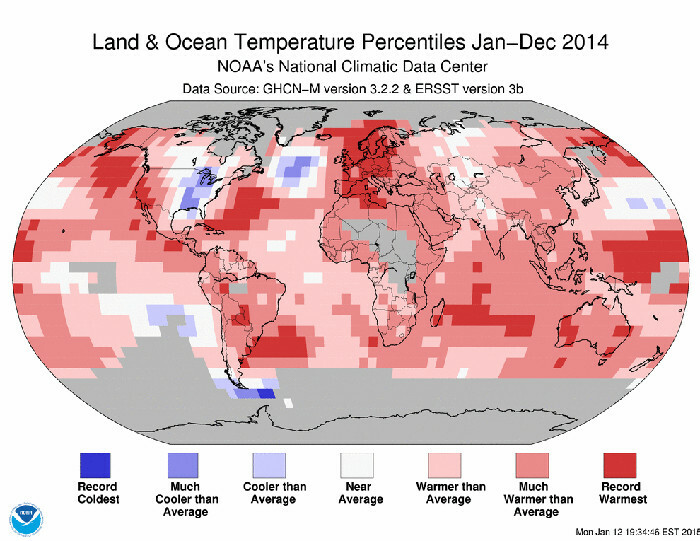 A record warm December sealed the deal to make 2014 the warmest year across the world's land and ocean surfaces since recordkeeping began in 1880. The average temperature for the year was 0.69°C (1.24°F) above the 20th century average of 13.9°C (57.0°F), beating the previous record warmth of 2010 and 2005 by 0.04°C (0.07°F). This marks the third time in the 21st century a new record high annual temperature has been set or tied and also marks the 38th consecutive year (since 1977) that the annual temperature has been above the long-term average. To date, including 2014, 9 of the 10 warmest years on record have occured during the 21st century. 1998 currently ranks as the fourth warmest year on record. This is the first time since 1990 the high temperature record was broken in the absence of El Niño conditions at any time during the year in the central and eastern equatorial Pacific Ocean, as indicated by NOAA's CPC Oceanic Niño Index. This phenomenon generally tends to increase global temperatures around the globe, yet conditions remained neutral in this region during the entire year and the globe reached record warmth despite this. Six months of 2014 (May, June, August, September, October, and December) were record warm, while April was second warmest, January, March, and July were fourth warmest for their respective months, and November was seventh warmest. Overall, the global annual temperature has increased at an average rate of 0.06°C (0.11°F) per decade since 1880 and at an average rate of 0.16°C (0.28°F) per decade since 1970.